I have given some thought to the topic of Elvis’s costars and decided to make up a list of those that I enjoyed seeing over the years. A reminder—the focus here is not on Elvis’s costars but on characters they played. When I didn’t know who played the part, I checked it out on IMDB (Internet Movie Database) website. That’s www.imdb.com. 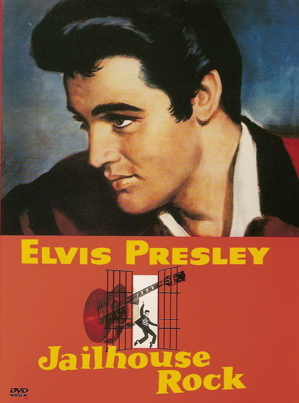 And so I start with the ’50s films and see who I liked in Love Me Tender, Loving You, Jailhouse Rock, and King Creole. In Love Me Tender the only character that I found really interesting was Vance Reno, as played by Richard Egan. I always liked Richard Egan and found him to be a pleasant screen personality in this and his other films. In Loving You I liked Elvis’s friend Teddy, played by Skip Young, who is seen only briefly in the beginning and at the end. In Jailhouse Rock the two actors I found especially entertaining were Vaughn Taylor, who played Mr. Shores, and Hugh Sanders as the prison warden. In King Creole I found only one character to be highly entertaining, and that was Shark, as played by Vic Morrow. His running dialogue with Elvis’s Danny Fisher I thought was most entertaining, especially in the dark alley confrontation scenes. Now on to the ’60s films and my choices in G.I. Blues, Flaming Star, Wild in the Country, etc. In G.I.Blues, even 40 years on, I didn’t know who played who in smaller roles. This is where I really had to go to IMDB and look them up. The characters I liked were Cookie (Robert Ivers), Rick (James Douglas), Sergeant McGraw (Arch Johnson), Turk (Jeremy Slate), Papa Mueller (Fred Essler), the puppet show owner (Ludwig Stossel), and Dynamite (Edson Stroll). In Flaming Star I think the only character of mild interest is Buffalo Horn, as played by Rudolph Acosta. I found everybody else (talking about costars only) dull and boring. In Wild in the Country Sam Tyler (Harry Shannon) and Professor Joe Larson (Alan Napier) were of mild interest. In Blue Hawaii I found only two actors that were really entertaining—John Archer as Jack Kelman and Howard McNear as Mr. Chapman. And, although, I still don’t know their names, I liked Elvis’s beach boy friends. Follow That Dream had a number of entertaining characters. I enjoyed watching Carmine (Jack Kruschen); Nick (Simon Oakland); the judge (Roland Winters); Mr. King (Alan Hewitt); George (Howard McNear)’ Jack (the hired hitman), played by Frank de Kova; Mr. Endicott (bank manager), played by Herbert Rudley; Al (Robert Carricart); and Blackie (John Duke). As much as I liked Arthur O’Connell in Kissin’ Cousins, in Follow That Dream he doesn’t appeal at all. In Kid Galahad, strangely, the only interesting characters for me were the gangsters Otto Danzig (David Lewis), Marvin (Richard Devon), Ralphie (Jeffrey Morris), and Danzig’s hood (Chris Alcaide). The nice characters, including Charles Bronson, were boring. Girls! Girls! Girls! had three people that I found interesting. They were Wesley Johnson (Jeremy Slate); Mack (Ken Becker); and Mrs. Arthur Morgan (Ann McCrea), with whom Elvis had a conversation in the boat immediately after opening titles. It Happened At the World’s Fair had only two characters that I liked. One was Sheriff Garland, played by Russell Thorson. I am partial to him because I remember him as Otto Lindstrom in the old TV show The Detectives, which starred Robert Taylor. The other memorable character was Mr. Farr, played by Robert Williams. He was more prominent as Swanson in Viva Las Vegas. I remember when I first saw It Happened At the World’s Fair in the ’60s, I liked Gary Lockwood in it. Somehow he didn’t appeal any more on a recent DVD viewing of the film. Fun in Acapulco, my all time favorite film, has a number of best loved characters, starting with Dolores Gomez (Elsa Cardenas), Raoul Almeido (Larry Domasin), Moreno (Alejandro Rey), Jose Garcia (Robert Carricart), desk clerk (Francisco Ortega), bellboy (Robert De Anda), waiter (Don Diamond), and Acapulco Hilton manager Mr. Ramirez (Alberto Morin). Paul Lukas played his role well but didn’t appeal. Viva Las Vegas is a very enjoyable film with a number of exciting people in it. I liked Count Elmo Mancini, played by Cesare Danova. In the same year, he played the servant of Cleopatra, Apollodorus. He appeared early in that film carrying Cleopatra, wrapped inside a rug, to Caesar. Other favorites in Viva Las Vegas are Mr. Martin (William Demarest), Shorty Farnsworth (Nicky Blair), The Jubilee Four singing “The Climb,” Jack Carter (himself), and Swanson (Robert Williams). 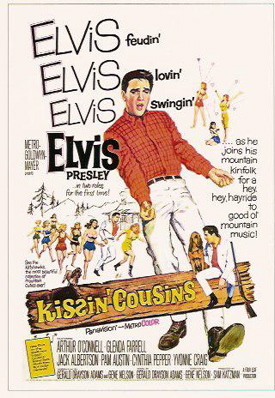 Kissin’ Cousins for me is an overall great comedy and a nice pleasant musical. I always thought the misspelled title was amusing, and I love the opening song with the rural boy and girl kissing in the titles' background. The fun characters start with the two generals at the Pentagon meeting. There were six or eight generals, but the only two having a discussion were General Kruger (Robert Carson) and General Donford (Donald Woods). Then we have Captain Salbo (Jack Albertson), Pappy Tatum (a very funny performance by Arthur O’Connell), Ma Tatum (Glenda Farrell), Sergeant George Bailey (Tommy Farrell), and Dixie Cate (Hortense Petra). Girl Happy, one of Elvis’s more enjoyable films, has a number of interesting characters that I enjoy watching. We have Big Frank (Harold J. Stone), Andy (Gary Crosby), Wilbur (Joby Baker), and Doc (Jimmy Hawkins). It was nice to see Jimmy Hawkins as a grownup after seeing him as Annie Oakley’s kid brother Tagg Oakley in the 1954 TV series Annie Oakley, starring Gail Davis. Also interesting in Girl Happy are Sunny Daze (Nita Talbot); Sergeant Benson (Jackie Coogan); Brentwood Von Durgenfeld (Peter Brooks); Mr. Penchill, owner of Seadrift Motel (John Fiedler); Betsy (Chris Noel); Laurie (Lyn Edgington); Louie, who calls Big Frank to the phone (Tommy Farrell); Police Lieutenant (Milton Frome), “Wolf Call” O’Brien (Norman Grabowski), and Officer Wilkins (Richard Reeves). Tickle Me had some things I didn’t like, such as the stupid ending when Jack Mullaney trips and falls into a round tin basin tied to the back of the wedding car. It spoils the final song, “Slowly But Surely.” But the good things outweigh the bad. I tremendously enjoyed the “reliving the old days” sequence in a western saloon with a sight gag of Elvis giving Edward Faulkner a Band Aid after shooting him in the hand. It was a fun film with lovable characters, such as Stan Potter, played by the above-mentioned Jack Mullaney. I also liked Vera Radford (Julie Adams), Brad Bentley (Edward Faulkner), and Deputy Sheriff Sturdivant (Bill Williams, whom I fondly remember as Kit Carson in the 1951 TV series The Adventures Of Kit Carson and later as Bill Greer in the 1960 TV series Assignment Underwater). Harum Scarum is a controversial film that many fans don’t like for various reasons. Some hate the Eastern soundtrack, while others think it’s a film for 10-year-olds. I found more things to like than to dislike; consequently it’s on my “11 Good Elvis Films” list. 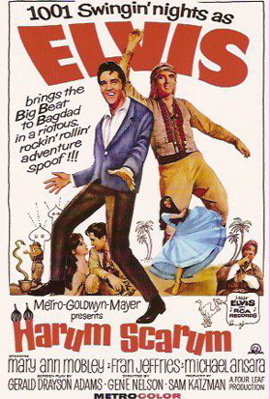 For me Harum Scarum is a spoof of Rudolph Valentino’s “The Sheik” from 1921. I can judge because I saw “The Sheik” once when it was shown on Australian television in the late 1960s. Valentino was my mother’s favorite movie star when she was a teenager in the 1920s. He was extremely popular in his time and, in my opinion, Elvis Presley is the only movie star to equal, if not surpass, Valentino’s popularity. The film’s interesting characters start with Aishah (Fran Jeffries) and Prince Dragna (Michael Ansara). I’ve always liked him since he played Cochise in the 1956 TV series “Broken Arrow.” Then there’s Zacha, the marketplace thief (played magnificently by Jay Novello); Sinan (Theo Marcuse); Heroine of “Sands Of The Desert” (Carolyn Carter, even though she doesn’t speak in her scene); and US Ambassador McCord (Hugh Sanders, who we last saw as the prison warden in Jailhouse Rock). Frankie and Johnny is not a bad little film. It has some nice songs and a few characters of interest. They are Cully (Harry Morgan), Mitzi (Sue Ane Langdon), Blackie (Robert Strauss), Braden (Anthony Eisley, who I liked as Tracy Steele in the 1959 TV series” Hawaiian Eye”), Gypsy (Henry Corden), Princess Zolita (Naomi Stevens), and the proprietor of the costume shop (James Millhollin). The others, like Nellie Bly (Nancy Kovack) and Peg (Audrey Christie) didn’t appeal. Paradise Hawaiian Style is another controversial film that many fans didn’t like. Many thought the soundtrack boring and the story dull and boring, but it depends on what one is looking for when watching Paradise Hawaiian Style. My only complaint about this film is that it wasn’t in widescreen like Blue Hawaii. With all the beautiful scenery, exotic locations, and good song sequences, it should have been in Technicolor and Panavision. I think that in some ways Paradise Hawaiian Style improved on Blue Hawaii. It showed more Polynesian customs and traditions, as in the scenes dealing with the visits to the Polynesian Cultural Center, which showed not only Hawaiian but also other Pacific Islanders. On the first visit the singing of “Pearly Shells” by the Hawaiian singers is very well done. Then comes the ride in the canoe and Elvis singing “Drums Of The Islands” (this should have been in widescreen). There’s more of the Center in the finale. The interesting characters for me were Danny Kohana (James Shigeta), Jan Kohana (Donna Butterworth), Donald Belden (John Doucette), and Mrs. Barrington (Doris Packer). Spinout is a fun film with some nice songs. I especially like the “Spinout” song scene and the nice chemistry between Elvis and Shelley Fabares, seen previously in Girl Happy. I liked the characters of Diana St. Clair (Diane McBain, who was beautiful as Daphne Dutton in the 1960 TV series “Surfside 6”), Les (Deborah Walley), Curly (Jack Mullaney), Lieutenant Tracy Richards (Will Hutchins, who was Tom Brewster in 1957 TV series “Sugarfoot”), Philip Short (Warren Berlinger), Larry (Jimmy Hawkins), Howard Foxhugh (Carl Betz, who was Dr. Alex Stone in the 1958 TV series “The Donna Reed Show”), Bernard Ranley (Cecil Kellaway), Violet Ranley (Una Merkel), and Blodgett (Frederick Worlock). Double Trouble gave us Elvis in a mixture of comedy, crime, drama, and songs. It appealed to me because it had a beautiful leading lady, Annette Day; some good songs, such as “I Love Only One Girl,” “City By Night,” and “Old MacDonald”; and some interesting characters. They include Gerald Waverly (John Williams), Claire Dunham (Yvonne Romain), Archie Brown (Chips Rafferty), Arthur Babcock (Norman Rossington), Georgie (Monty Landis), Inspector de Groote (Leon Askin—love him as General Burkhalter in “Hogan’s Heroes”), Captain Roach (Stanley Adams), First Mate (Walter Burke), and the Frenchman (Maurice Marsac). Didn’t like The Wiere Brothers. Easy Come, Easy Go wasn’t a bad little film. I liked the first half, while Elvis was in uniform, but the second half was dull and boring. The interesting characters were Dina Bishop (Pat Priest), Judd Whitman (Pat Harrington), and Lieutenant Marty Schwartz (Sandy Kenyon). Didn’t care for Elsa Lanchester or any of the others. I didn’t like the songs in Clambake, except the opening song, but I loved the story. I heard some people say it’s “The Prince And The Pauper” theme. Whether that’s the case or not, I keep watching it over and over. I love it. Some characters I really love to watch are Tom Wilson (Will Hutchins); J. J. Jamieson (Bill Bixby); Sam Burton (Gary Merrill); Duster Heyward (James Gregory); Harold the doorman (Harold Peary); Mr. Hathaway (Jack Good); Ellie, Duster’s secretary (Amanda Harley); the Cigarette girl (Sue England); and Paul the bartender (Lee Krieger). Speedway for me was the last of the good 60s films. It was a nice little comedy with some good songs, and it had a leading lady in Nancy Sinatra who was an established singer in her own right. It was Elvis’s last film with motor racing in it. When I noticed in the opening titles the listing of several real-life racing drivers, I wondered if this movie might be trying to imitate John Frankenheimer’s Grand Prix motor racing film from 1966. The interesting characters were Kenny Donford (Bill Bixby), R. W. Hepworth (Gale Gordon), Ellie Easterlake (Victoria Meyerink), Birdie Kebner (Carl Ballantine—I enjoyed his antics as Lester Gruber in the 1962 TV series “McHale’s Navy”), and Juan Medala (Poncie Ponce, who was Kazuo Kim in “Hawaiian Eye”). 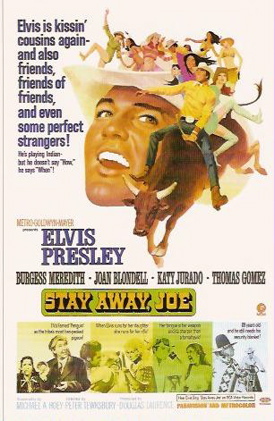 I don’t like to say a bad thing about any Elvis film, but for me Stay Away, Joe is Elvis’s worst film. I found Elvis’s character, Joe Lightcloud, to be really distasteful, and the adult level comedy story is totally unappealing. On the good side, the opening scene was very well done with Elvis singing “Stay Away” to the tune of “Greensleeves.” I always liked “Greensleeves,” and Elvis sings it better than all the others I’ve heard do it. The Arizona outdoors looked glorious in Metrocolor and Panavision. Were there any interesting characters? I think only the two ladies Annie Lightcloud (Katy Jurado) and Mrs. Hawkins (Anne Seymour). Live a Little, Love a Little is only a fraction better than Stay Away Joe. It has a distasteful leading lady (Michelle Carey), whose character (Bernice) has been described by some as a “woman of the world.” She didn’t appeal to me at all. Elvis’s character, while slightly better than Joe Lightcloud, was also distasteful. The story again was too much on the adult level and quite unappealing. On the good side it has a good song in “A Little Less Conversation,” but you have to sit through half the film before you hear it. The interesting characters were the milkman (Sterling Holloway) and Ellen (Celeste Yarnall). Charro!, Elvis third western, has only one song, which is sung over the opening titles. Some say it was trying to show Elvis in a Clint Eastwood role. If so, it was not very well done. Elvis in a non-singing role was a novelty but it didn’t appeal to me. On the good side, I didn’t mind the saloon scene in the beginning, when Elvis as Jess Wade asks the bartender if anybody has come asking for him today. The bartender replies “No, Charro.” The characters of some interest were Mexican Lieutenant Rivera (Tony Young) and Hackett gang members Mody (Charles H. Gray) and Gunner (James Sikking). The Trouble With Girls is still another unappealing film. Elvis is on screen so little that he might be a supporting actor. The story is dull and boring, and the songs are few and not that good. On the good side, we have the appearance of Vincent Price as Mr. Morality. Also interesting were the Pacific Palisades High School Madrigals.